Welcome to the start of my Get your Aussie on - Nail Art Marathon. 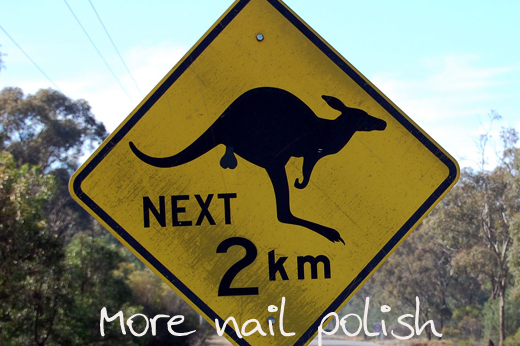 Ok it's not really a marathon, cause it's only going to be about 5 or 6 manis, but what you will see is some totally bogan and cliched Aussie themed nail art in the lead up to Australia Day on 26 January. 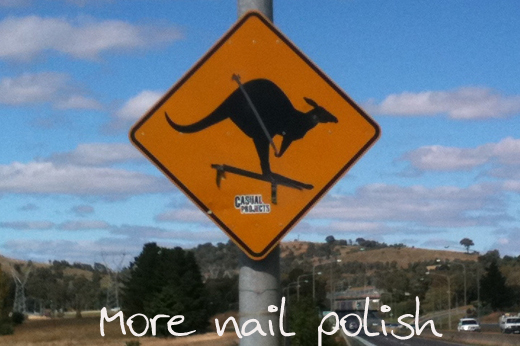 I know that most of my readers are international so I'm planning to pick classic Aussie icons for my nails. Today's nail art is certainly that. Kangaroos. And not just any kangaroos, these are the kangaroos as they appear on our yellow road signs. 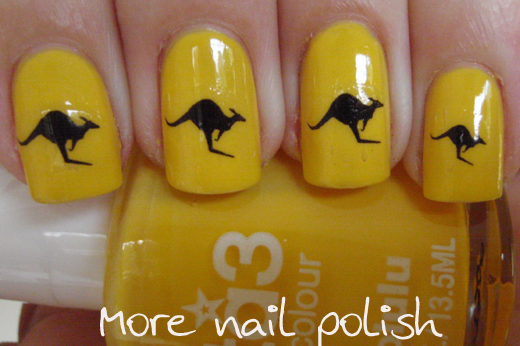 I made these using my water decal paper, which I printed the kangaroos on, then cut out and placed on my nails. That's why each one is so identical and crisp. There is no way I could free hand anything like this. Now to share some pictures of real kangaroo road signs. These are a couple from around my area that have been creatively vandalized, so to speak. This one is on the Tuggeranong Parkway and shows the roo downhill skiing. 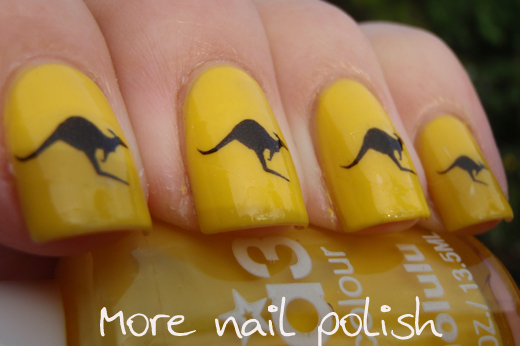 Aussie gals, are you going to do some Aussie nail art too. If so, when you do, post a link in the comments of any of these posts, we'd all love to see them. 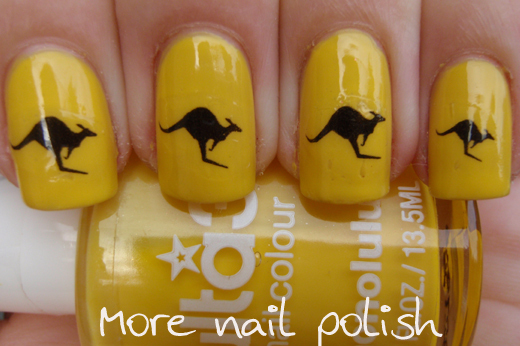 I love the kangaroo nails! Very cute! Love it! Im musing over what to wear on Thursday, Ive got my yellow and green picked out just not really sure on a design. those totally rock! What water decal paper do you use? I'm planning something green and gold but probably not until Wednesday. The brand is 'incal' and its called Waterslide Decal Paper. I got it of ebay mid last year. I can print on it with my inkjet, but have to seal it before going in water. So I just wipe nail polish over the design on the paper and it works perfectly. The water decal paper is great. Makes doing neat nail art so easy. LOL! That's so cute! I love these and your inspiration! Thanks, and the road signs made me laugh too. That is seriously one of the cutest things I've ever seen. Just perfect! This is awesome! I haven't though of a design yet but I'll be trying something for Wednesday. Nice touch with the Aussie made nail polish too. I've got a really old bottle of Honolulu but mine's a different version, it's pink! Yeah, it's a shame that the new Ulta3's aren't Aussie made, but at least this one was. Wow I hadn't heard of a different version of Honolulu, but I know they have done it lots of times with other colours! This is so creative! I love it! !